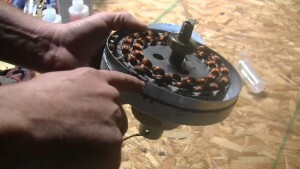 This 7 Part Video series shows the conversion of a old unused ceiling fan into a power generator.Part One shows the dismantling of the ceiling fan and how to wire it up.Part Two shows how to insert a metal banding used for attaching the magnets around the stator. Part Three shows how to orient/place the magnets inside the ceiling fan housing to achieve a voltage reading.Part Four shows how to mount the face plate and create your own turbine blades. Part Five shows how to build the body to support the turbine.Part Six shows how to mount the turbine unit onto the body as well as partially lighting a CFL bulb with a quick spin.Part Seven is the final part that shows how to wire up the turbine to the diode bridge rectifier and taking it for it’s first flight.